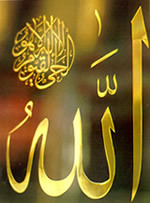 The Arabic verb hasaba means to count and number; Allah, Praise and Glory be to Him, says, “The sun and the moon follow courses exactly computed.” (RAHMAN, 6). In the previous verse, we perceive that in the great astronomical universe there are exact mathematical laws which bear witness to Allah’s Wisdom. He also counts what His people do to reward them for any good deeds, “Soon will his account be taken by an easy reckoning” (INSHIQAQ, 8). Allah is the RECKONER as all creatures will be called to account at the same time, “..and He is the Swiftest in taking account.” (AN‘AM, 62), where nobody save Allah can do this. The words husban, yahtasib, hassb and hasseeb are also derived from the same verb hasaba. The general meaning of the word husban, is any punishment by way of reckoning as in, “and that He will send on thy garden thunderbolts by way of reckoning from heaven.” (KAHF, 40), where the implied punishment is that of thunderbolts; yahtasib means to imagine or reckon; it could also mean to expect, as in, “And He provides for him from sources he never could imagine.” (TALAQ, 3); hassb means the protector, as in, “But if they turn away, say: God sufficeth me” (TAUBA, 129); whereas hasseeb means the one who suffices, the trustee, and the one who judges, as in, “..but All-Sufficient is God in taking account.” (NISAA’, 6) “..sufficient is thy soul this day to make out an account against thee.” (ISRAA’, 14), and hasseeb also means the honourable and noble. The RECKONER is He Who grants His creatures their sufficient, and this attribute is unimaginable save in relation to Allah. Everyexisting being is in need of what suffices him to maintain and perfecthis existence; Allah is the Sufficer for everything, only by HisMercy things exist, remain and are perfected. If all the means are sufficingsuch as the mother’s milk for the infant, food for the adult, air for breathing,and money for the wealthy, then one must believe that the Creator of allthese means is Allah, Praise and Glory be to Him. He alone is the One who grants everyone and everything what suffices them to maintain their existence, where everything depends on His Power and Ability to create all means according to His Wisdom and Favour. Praise and Glory be to the RECKONER, He is Allah.